The Mini's compact size does nothing to diminish the Cry Baby legacy, thanks to top-class sounds and functionality. It had to happen eventually: hot off the back of its Mini Fuzz Faces, Dunlop has chopped the Cry Baby in half, but without sacrificing spec. As well as true bypass switching, a smooth-riding Hot Potz potentiometer and red Fasel inductor, the Mini also packs an internal three-way switch, which chooses between low, vintage and GCB95 voicings. Finally, it's powered by either a nine-volt battery or power supply. On first sweep, there's a surprising amount of travel on the Mini, more akin to a full-size Cry Baby than similar mini wahs. Your heel moves further back than on a regular wah, though, so best get that ankle in shape! On the middle 'vintage' setting, the pedal's sweep is full and wide - it's closer to Dunlop's higher-end 535Q or CAE wahs than the standard-issue GCB95, thanks to a gradual transition from bass to treble that does away with harsh high-end in the toe-down position. However, if you want to engage the GCB95's wiry upper range, a quick flick to the right on the three-position switch does the trick, while the low position gives you a throaty, resonant tone for synth-y sweeps on lower strings. 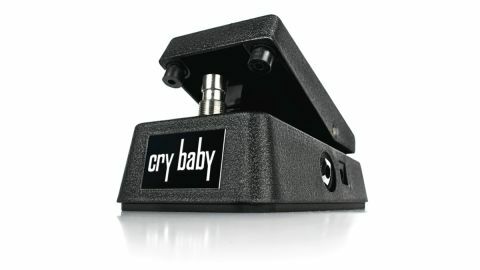 The Cry Baby Mini injects new life into the age-old wah formula, and any complaints we have about the lack of LEDs, easier battery access or external switches pale into insignificance when you consider the boutique-level tone and high-quality construction on display. For downsizers, mini-'boarders and anyone searching for a reasonably priced, classic-sounding wah, the CBM95 is a must-buy.